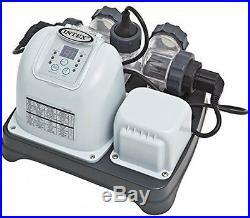 Hayward XStream Swimming Pool Cartridge Filter 1.5 HP Pump System CC15093S. Spas & Hot Tubs. 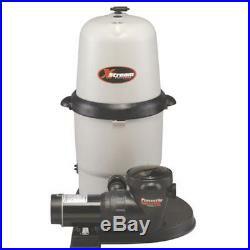 HAYWARD 150 SQ FT XStream FILTER SYSTEM W/1.5 HP MATIX PUMP. For Owner’s Manual. XStream size for an XStream Clean. Once you see the new XStream filtration from Hayward, you’ll be hooked. Its massive size and incredible performance mean years of trouble-free filtration. It has an extra large capacity for dirt and debris and a quick-release, high-capacity air relief valve. But size isn’t the only thing this filter’s big on. The Xstream Filtration makes daily operation and servicing more convenient than ever before… Convenience where it counts. The XStream Filtration makes daily operation and servicing more convenient than ever before. It’s engineered to install easily with both flexible and rigid plumbing. Plus, the Easy-Lok ring design gives you quick access to all internal components in a single turn. And a new glass-reinforced, noncorrosive PermaGlass XL filter tank ensures long-lasting, hassle-free operation. Designed specifically for the rigors of above-ground filtration. Engineered for easy use with flexible or rigid plumbing. Sleek, flush mounted pressure gauge. Quick release, high capacity air relief valve. Glass reinforced, non-corrosive Permaglass XL filter tank will provide years of trouble-free operation. Easy-Lok ring design allows quick access to all internal components in a single turn. Unique safety catch prevents over-tightening of the lid and efficiently secures the filter for high performance operation. Filter system includes cartridge. Filter system includes 1.5 hp Matrix model# SP1593 pump. Longer, more efficient filtering life. Larger filter body ensures an equal distribution of dirt and debris throughout the filtering element. Dimensions: 21″ Width x 37 1/4″ Height. Effective Filtration Area: 150 sq. Design Flow Rate: 120 GPM. Turnover (In gallons): 8 hrs 57,600 gallons, 10 hrs 86,400 gallons. Customers who have shopped with us before can tell you. Specialty Pool Products. Offers the finest, most innovative and most effective items for your pool, spa, backyard and home. We only sell products that meet our strict standards for quality, function and value. And there’s more… Specialty Pool Products also promises you. We are unable to make changes or cancellations to orders after they are placed. Oversized deliveries are curbside only with FREE Lift Gate Service. If the combined weight of your order is 500 lbs. At SPP, your satisfaction is always our primary concern. During peak times our response may be delayed as we do receive hundreds of emails daily. We hold ourselves to the highest standards and value the trust you place in us. We pledge not to share this information with other organizations for commercial purposes. Specialty Pool Products does not rent or sell its customer list. The item “Hayward XStream Swimming Pool Cartridge Filter 1.5 HP Pump System CC15093S” is in sale since Monday, October 09, 2017. This item is in the category “Home & Garden\Yard, Garden & Outdoor Living\Pools & Spas\Pool Equipment & Parts\Pool Filters”. The seller is “specialtypoolproducts” and is located in United States. This item can be shipped to United States. 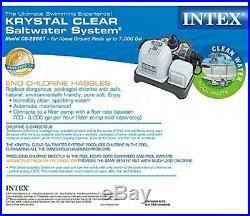 Intex Krystal Clear Saltwater System E. Electrocatalytic Oxidation Brand New. The Krystal Clear Saltwater System combines a unique two-stage technology to sanitize pool water. First, an undetectable level of natural swimmer-safe chlorine is produced when environmentally friendly natural salt is added to pool water and passes through a titanium electrolytic cell during the filtration process. The result is soft, fresh, clean water without the potential harsh side effects of packaged pool chemicals. Second, with the E. (electrocatalytic oxidation) process, water molecules are split into highly powerful oxidants which destroy organic contaminants such as bacteria and algae. The combination of these powerful oxidants with natural chlorine results in the strongest and safest pool water sanitation. 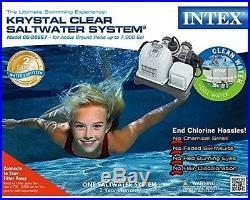 This second process, unique to the Intex Saltwater System, provides consumers with an important benefit. The process of E. Is so effective; the amount of natural chlorine needed and generated by the system is reduced by approximately 60%. Which means that your customers not only get the great benefits of a saltwater system, they enjoy it with much less chlorine than other saltwater systems generate! Pool size: 7,000 gal (26,500L). 110-120V with GFCI (Ground Fault Circuit Interrupter). Requires a filter pump with a flow rate between 700-3,000 gph (2,650 – 11,355L/hr). Chlorine output: 5 g/hr. 24 hr. Pool size: 7,000 gal (26,500L). 110-120V with GFCI (Ground Fault Circuit Interrupter). Requires a filter pump with a flow rate between 700-3,000 gph (2,650 – 11,355L/hr). Chlorine output: 5 g/hr. Please refer User Manual, Trouble Shooting step under product details. 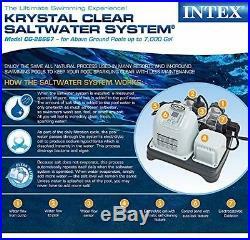 The item “Intex Krystal Clear Saltwater System E. C. O. Electrocatalytic Oxidation Brand New” is in sale since Friday, May 19, 2017. This item is in the category “Home & Garden\Yard, Garden & Outdoor Living\Pools & Spas\Pool Equipment & Parts\Pool Filters”. The seller is “7jp0214_ku-pecoli-japan” and is located in Multiple Locations. This item can be shipped to United States, Canada, United Kingdom, Denmark, Romania, Slovakia, Bulgaria, Czech republic, Finland, Hungary, Latvia, Lithuania, Malta, Estonia, Australia, Greece, Portugal, Cyprus, Slovenia, Japan, Sweden, Indonesia, Taiwan, South africa, Thailand, Belgium, France, Hong Kong, Ireland, Netherlands, Poland, Spain, Italy, Germany, Austria, Russian federation, Israel, Mexico, New Zealand, Philippines, Singapore, Switzerland, Norway, Saudi arabia, Ukraine, United arab emirates, Qatar, Kuwait, Bahrain, Croatia, Malaysia, Brazil, Chile, Colombia, Costa rica, Dominican republic, Panama, Trinidad and tobago, Guatemala, El salvador, Honduras, Jamaica. 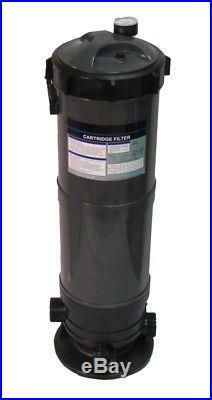 Cartridge Filter System with Pressure Gauge for Swimming Pools 120SF. HIGH QUALITY AND LARGE CAPACITY AT THIS GREAT PRICE! Extra large cartridges reduces cleaning. Rugged polymer tank with built in Pressure Gauge. Big easy to handle Spin Lock Lid. Simple to use Air Relief Valve. Large 1 1/2 inch Drain Plug. Do it your self-installation. This filter system has set the standard for quality, superior flow rates, and unmatched water clarity. This filter system has a built in pressure gauge and air relief valve. The rugged filter tank is constructed of tough weather resistant and corrosion proof polymer plastic. Inside, our extra large filter elements produce water quality superior to sand filters without backwashing. Large 1inch drain plug to ensure easy clean up and quick water drainage. They require a minimum of cleaning, insuring hassle free operation. The item “Cartridge Filter System with Pressure Gauge for Swimming Pools 120SF” is in sale since Wednesday, September 13, 2017. This item is in the category “Home & Garden\Yard, Garden & Outdoor Living\Pools & Spas\Pool Equipment & Parts\Pool Filters”. 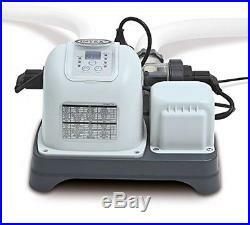 The seller is “bestpoolbuys” and is located in Champlain, New York. This item can be shipped to United States, Canada.